Metapost: You look like you can use some Mary Worth merchandise! Feast your eyes on panel one, everybody, because you’ll see that rarest of sights: Coach Thorp engaged in actual coaching! Assuming, of course, that you consider responding to desperate pleas for guidance with irritating, unhelpful gnomic pronouncements to constitute “coaching,” which, you know, Gil clearly does! Since it includes the creepy, menacing figure of Steve Luhm sitting in the bleachers, panel one is also setting up an extremely common Gil Thorp sight: Gil finding some random community member who’s willing to take on coaching duties (without pay, naturally). First it was the mother of a member of the girl’s basketball team, who couldn’t stop shouting suggestions from the stands; then it was some crazy old man who just started showing up at baseball practice one day; so now, sure, let’s let the janitor do it, why not. And what intriguing advice he has! Micah, the key to basketball glory is to be loud and obnoxious, like your sister! You know, one I was just hitting on! Yes, you’re right to be sweating freely. OK, this is officially the saddest and weirdest Funky Winkerbean yet, and it’s a strip that pretty much specializes in sad and weird. “Crazy” Harry lives up to his nickname, telling Mopey Pete that only here in this dingy pizza parlor is he allowed to verbalize any happiness whatsoever, because otherwise They will have some kind of unspecified but unpleasant vengeance to dish out. Briefly he imagines himself to be Linus in the pumpkin patch, with … an expression of happiness being insincerity, and the “happiness police” being the Great Pumpkin, I guess? Point is, the guy’s clearly insane, but somehow this rambling madness will convince Pete that Montoni’s is the place where he wants to wile away the time until his death from a massive coronary. Meanwhile, over in the comic strip that specializes in weird and hilarious, we finally learn what drove apart Wilbur and Abby: a sinister gang of scowling pompadoured Richie Riches. Look at them, striding around with their jackets on and their collars defiantly open! What free-spirited young lady (or dead-eyed zombie, if panel two is an accurate depiction) could resist them, even she was already carrying another man’s child? Particularly if it was an unlikeable, Wilbury man’s child? I’ll tell you right now: I’m kind of a fan of classic old radiators! We have them in our house, and I love ’em! 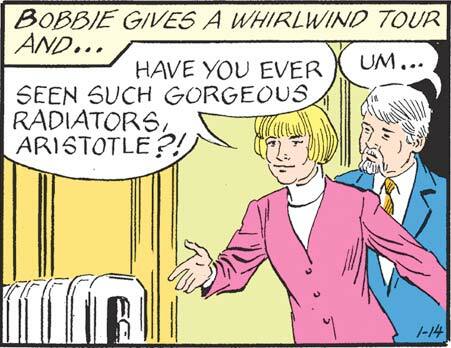 And Bobbie, those radiators are nothing special. Come on, there’s not even any decorative work on the metal! Also, I used to kind of be a fan of crazy ladies! And relationships with them generally lead nowhere good. So I think “Um” is really the best response in this situation.